Hallux Limitus Surgery Pain in the big toe joint is one of the most common complaints I hear in my podiatry surgery practice. Pain in the big toe joint. 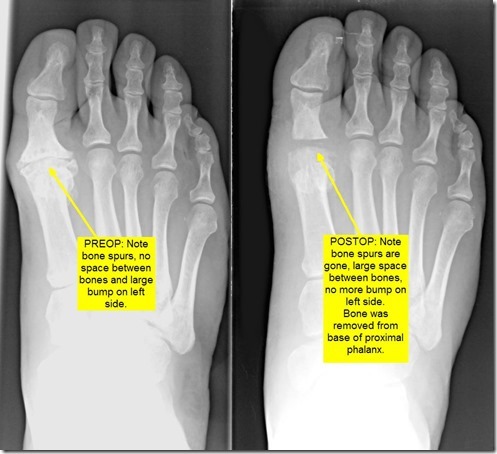 Hallux Limitus Surgery including before and after pictures. Arthritis of big toe joint. This pain can be caused by many things. I’ve already written blog articles on bunions and gout which are two very common causes of great toe joint pain. Click these links for those articles. Gout. Bunions. 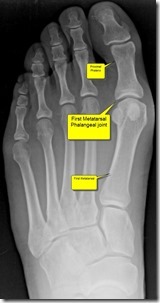 The medical term for the big toe joint is the “first metatarsal phalangeal joint”. This is because the two bones that make up the joint are the “first metatarsal bone” and the “first proximal phalanx bone”. (Click any picture to enlarge). 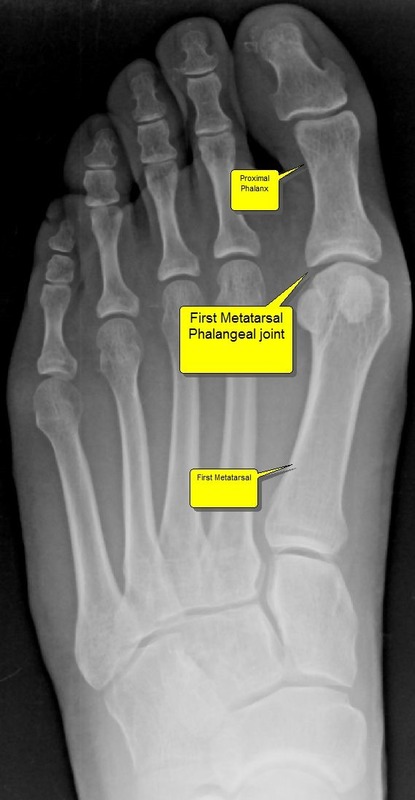 Doctors often refer to the big toe joint (“First Metatarsal Phalangeal Joint”) as the “First MPJ” or just “MPJ”. Pain in the big toe joint is one of the most common complaints I hear in my podiatric surgery practice. I really enjoy doing surgery for MPJ pain caused by arthritis in this joint because the surgery works so well. Arthritis is a general term for pain and inflammation of a joint and can be used to refer to any joint in the body. Arthritis of the big toe joint can be caused by many things: bunions, gout, inflammatory arthropathy such as rheumatoid arthritis and other autoimmune diseases, trauma, infection, bad shoes, overuse such as athletes, congenital malformation, congenital anomalies such as longer or shorter bones than normal, higher or lower bones than normal, misshaped bones or cartilage, functional anomalies like flat feet or curvature of bones of the leg, and some other that I’m sure I left out of this list. Most of the above lead to the slow progression of arthritis in the form of loss of cartilage of the joint. Cartilage is the smooth semi-hard substance between bones that allows bones to glide smoothly together in a joint and not grind or scrape each other. Once the cartilage is gone, bones grind on one another and cause pain and decreased range of motions. Additional sequelae of arthritis is formation of bone spurs. 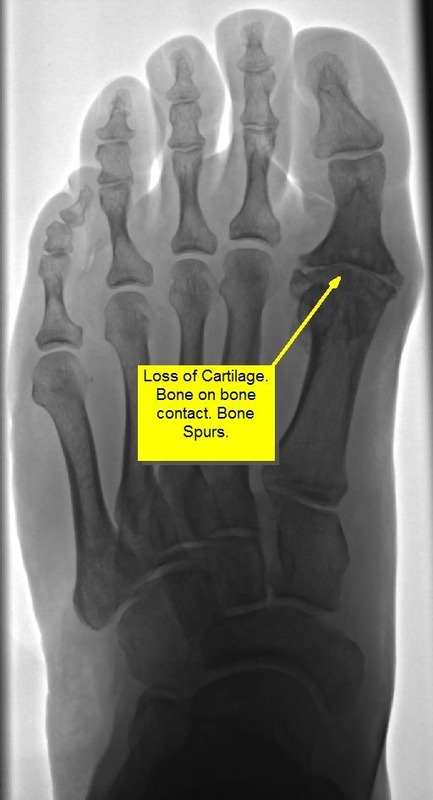 Bone spurs usually grow due to small micro-trauma to the bone that heals by producing more bone. Each time the bone heals the tiny breaks, it produces more and more bone until finally you have a piece of bone sticking out where it should not be. Bone spurs can cause joint to not move by blocking the normal range of motion. Once a joint doesn’t move, your body compensates by trying to move other joints to make up for the lack of motion. This, in turn, causes those other joints to have abnormal forces and range of motion and they get overused and injured leading to arthritis. 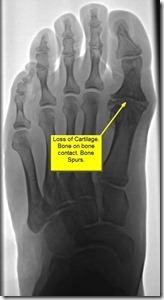 Signs and symptoms of big toe joint arthritis. Arthritis of the big toe joint presents with pain in the joint that usually starts off minor and intermittent and slowly progresses to happen more often and with more intense pain. Activities or certain shoes that didn’t hurt in the past, start to hurt more often and more intensely. Women often tell me that they progressively can wear their high heel shoes for less time or less distances before the pain starts. They say that they have to wear lower heels than previously. Patients report they cannot exercise as much as they used to before having pain. Arthritis is a problem that slowly progresses as the cartilage wears away. Sometimes people have arthritis but do not know it. I wrote an article not too long about about people who have bunions but no pain associated with them. One of the only times I tell people to have bunion surgery when they are not in pain is when they have signs of arthritis on x-ray but no associated arthritic pain. See the article here: When to have bunion surgery when you do not have pain. One of the main reasons people come in to see me for big toe joint pain is for something called Hallux Limitus. This Latin term comes from the word Hallux which is the medical term for the big toe and Limitus, which means limited range of motion of a joint. Hallux Limitus can be broken down into two major categories but both describe lack of range of motion of the big toe joint. The first kind is called Structural Hallux Limitus. This describes a joint that cannot move enough due to changes in the structure of the joint. This can be due to lack of cartilage between the bones, bone spurs that block the motion and sometimes bone growth that actually fuses the bones together. When the bones fuse together two bones actually become one piece without any space between them. The second kind of hallux limitus is called Functional Hallux Limitus. This describes a condition in which the bones don’t move enough due to abnormal forces on the bones of the foot. Most commonly people who have arches that collapse or flat feet have functional hallux limitus. When the arch collapses the first metatarsal bone gets pushed up and out of the way by the ground forces. 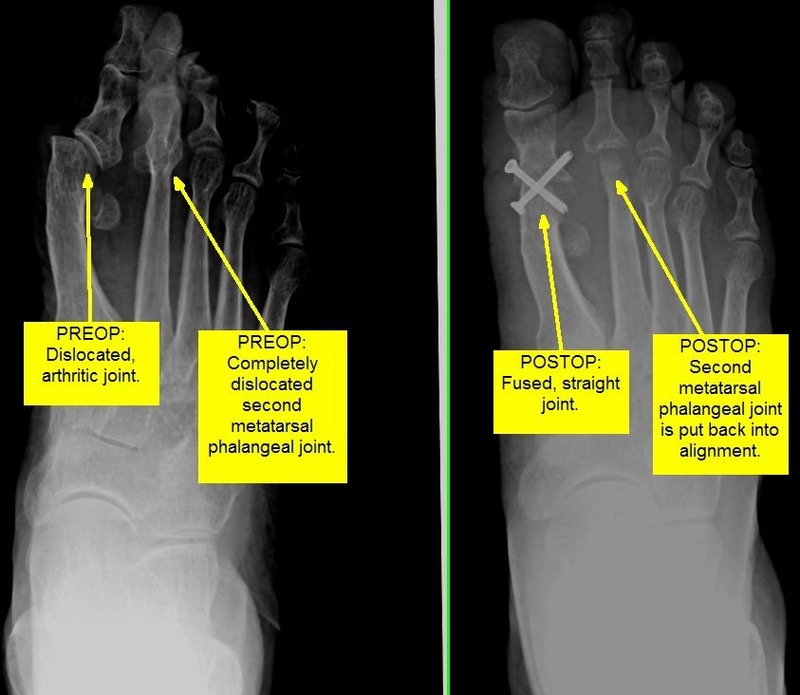 When the first metatarsal is elevated, the phalanx bone cannot move up enough to make it over the metatarsal and flex upwards to bend the toe joint. Functional hallux limitus leads to arthritis and bunions. In my article and video about bunions I describe how functional hallux limitus causes the bunion. See those articles and videos by clicking the links at the end of this paragraph. This blog will focus on hallux limitus and joint arthritis. Video describing bunions. Article describing bunion formation. As I stated above, functional hallux limitus often leads to big toe joint arthritis by causing abnormal forces on the joint and wearing away of cartilage which in turn leads to structural hallux limitus with loss of cartilage and bone spurs that block motion. Okay, we’ve now discussed what causes hallux limitus and arthritis as well as signs and symptoms of big toe joint arthritis. Next we will discuss treatment and surgery of them. When a patient comes into my office with a complaint of big toe joint pain, I first do a thorough history and physical exam. I ask them all about the pain including what it feels like, where they get it, how long have they had it, what was the onset like, fast or slow progression, what activities cause pain, what shoe types cause pain, and what treatments have they tried and which worked or did not work. Once I’ve established that detailed history I start my exam. I check the entire foot starting with the circulation, the nerves, and the range of motion of all the joints including the big toe joint. I check the muscle strength and tendons. I have the patient stand up to see how the foot looks weight bearing. The next part of the examination is the x-rays. The x-rays tell a big part of the story. I look for the length and position of the bones. I look at the amount of cartilage of the joints. I look for bone spurs or bone cysts. I look at the overall bone structure of the foot. Once I’ve completed my history and exam with x-rays I am able to determine the extent of the problem and the cause(s) of it. I then explain to my patients in layman’s terms all of this info. The next and most important step is the treatment of big to joint pain and arthritis. Most often the treatment is surgical but there are a few non-surgical treatments that can be done. I take great pride in my ethics and the ethical treatment of my patients that trust me to take care of them. I will try to keep this tangent as short as possible but I’m very passionate about the subject. I have a tremendous respect for my patients. I feel privilege to be a doctor and take care of patients. Strangers come to me for help and expect me to do the right thing, tell them the whole truth, and act in their best interest, not my own. I often think about other circumstances in life where this happens and I, unfortunately, cannot think of many or any for that matter. It seems that all businesses out there are out for profit and not for altruism. I make most of my profits by performing surgeries but I would never tell a patient that they need surgery when I can help them with a less invasive, less risky, less painful alternative non-surgical treatment. Unfortunately, in my career I have come across many doctors that do not practice this way and do make decisions based on profit to some extent at the cost of their patients but I will not expand on this further here. Okay, sorry about that divergence, back to treatment of big toe joint pain. 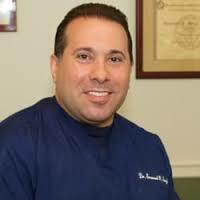 I was about to tell you about the non-surgical treatment of big toe joint pain. When the arthritis is not too severe non-surgical treatment works better than once the arthritis has progressed more. When there is functional hallux limitus and not structural hallux limitus, as described above, non-surgical treatment works better. Non-surgical treatment includes two things. The first is what we call palliative care. This means treating the symptoms of the problem, not the cause of the problem. The symptoms are pain and inflammation. We treat pain and inflammation with anti-inflammatory medications, or pain killers; pills and injections. Pills are often non-steroidal anti-inflammatories such as aspirin, Motrin, Aleve, Celebrex and many over-the-counter and prescription medications. Sometimes we use steroid pills as well for more severe inflammation. We also treat inflammatory symptoms with icing, rest, compression and physical therapy modalities. The second kind of non-surgical treatment addresses the lack of motion of the joint. We can increase range of motion with physical therapy and custom foot orthotics. Again, these work better for functional hallux limitus and not structural. Structural hallux limitus almost always requires surgery. As stated earlier, I like performing surgery for hallux limitus. The reason I like it is because by the time people need surgery they are usually in a great deal of pain and it affects their lifestyle, and it is such a big relief for them when I correct the problem. After I evaluate the cause and extent of the problem I decide on which surgical procedure to perform. There are a few different procedures to choose from. I’ll list them here and then describe each one. These procedures include: Cheilectomy, decompressional metatarsal osteotomy, Keller procedure of the proximal phalanx, joint implant arthroplasty, and joint fusion. Cheilectomy procedure for hallux limitus. The least destructive to the joint is called the Cheilectomy. A cheilectomy involves simply cleaning up the joint. I remove bone spurs and loose extra bones in order to allow the joint to move more freely and more normally. When I choose this procedure the cartilage has to be mostly intact as it does not address the lack of space between the bones, but only the extra bones that block motion. Below are before and after pictures of Cheilectomy procedure. Click to enlarge. Decompressional Osteotomy, Youngswick procedure for hallux limitus. One of the most common procedures I do is the decompressional metatarsal osteotomy procedure. One of these is called the Youngswick procedure named after the doctor that first described it. This involves cutting the metatarsal bone and moving it down and back in order to create more space between the metatarsal and the proximal phalanx. This is used to address a long or high metatarsal or a functional hallux limitus. Again, this procedure often requires there to be some cartilage left on the bones. Recently, I have been modifying this procedure in my own unique way in order to treat more advance loss of cartilage and I’m having excellent outcomes. Below are before and after pictures of a decompressional osteotomy. Click to enlarge. The next procedure is called the Keller procedure. This procedure is called more joint destructive because it involves removing part of the joint. I remove the base of the proximal phalanx bone in order to create a space between the bones. The trick here is to maintain that space for years after the surgery as it has a natural tendency for the bones to move back together over time. There are many ways doctors try to maintain this space including using metal pins to hold the bones while they heal, implanting cadaver soft tissue grafts and skin components between the bones and various other ways. I feel my way is the best and I have seen patients follow-up long term with preservation of the space. I modify the joint capsule around the joint and use it as a spacer between the bones. This is the most challenging and difficult part of the procedure but I have discovered a way to make it work. Below are before and after pictures of a Keller Procedure. Click to enlarge. The next procedure is the great toe implant arthroplasty or great toe joint implant procedure. I have performed many of these procedures in the past but often prefer other procedures over them. They work very well to reduce the painful arthritis but they often get stiff over time. 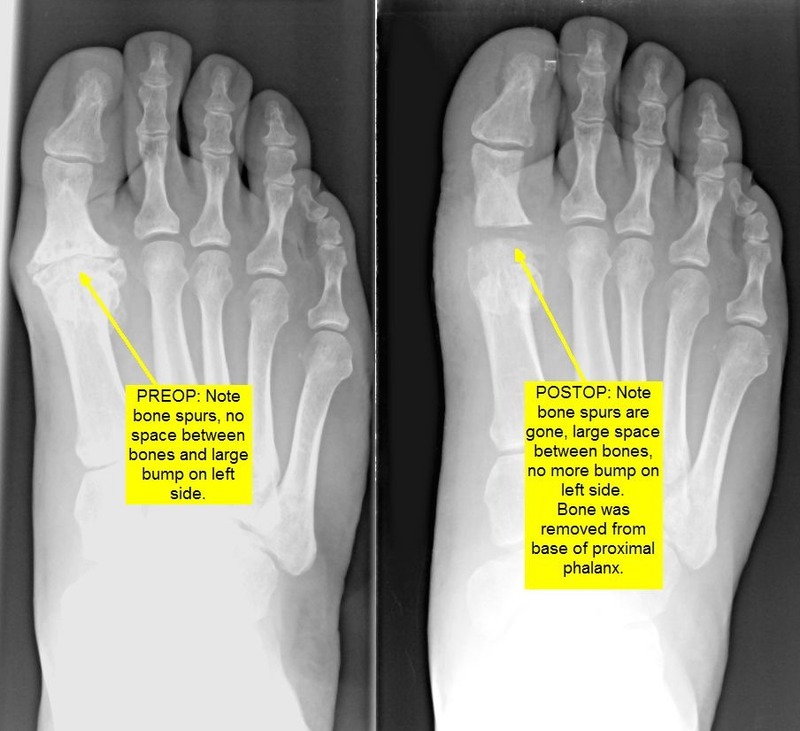 This procedure involves removing either the head of the metatarsal or the base of the proximal phalanx and replacing it with a metallic joint implant. The advantages are that it maintains the length of the toe cosmetically. The disadvantage is that I find they get stiff over time. I have not done one of these procedures in a while because many patients reported stiffness postoperatively. Below is a picture of after a joint implant Procedure. Click to enlarge. 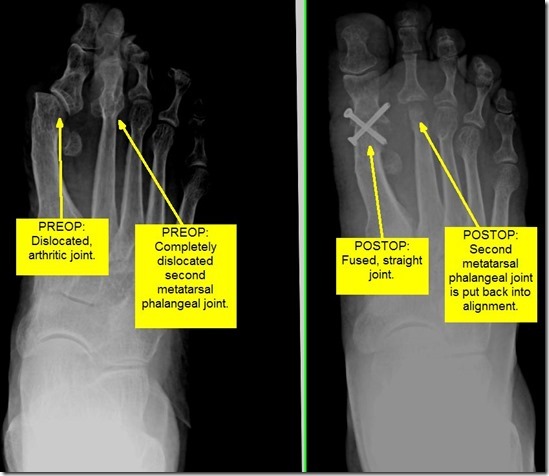 Joint fusion or metatarsal phalangeal joint arthrodesis for hallux limitus. The last procedure is called the joint fusion. This involves permanently fusing the metatarsal and phalanx bone together. The theory here is that if there is no motion, there is no pain, and that theory almost always works. The disadvantage is that you never can move your big toe joint again. This means that women can never wear a high heel again. Also, it can slow a patient down because as we walk faster or run, we need the big toe joint to move up more and the fusion blocks that. I reserve the fusion for patients that are more sedentary. I often perform fusions for people that have major angular deformity of the bone as well. When there is contracture of the soft tissues that misaligns the big toe joint or when the bones have been previously altered in other surgeries, I will perform a fusion. In the below example, I felt there was just no way that any less invasive procedure would realign this joint and give satisfaction to the patient. She had previous bunion surgery by another surgeon that had a bad outcome. In the end I fused her joint and her pain completely went away. She fit into shoes that she had not previously. She was an older patient that did not need to the mobility of a younger patient. She was extremely happy with the result and was pain free last I spoke to her over a year after surgery. Below are before and after pictures of a joint fusion Procedure. Click to enlarge. As you can see I am passionate about big toe joint pain and consider myself an expert in it. I hope you enjoyed reading this article as much as I enjoyed writing it. As with most of my articles I expect thousands of views from people around the world. I always love comments and emails about my articles and encourage them. I wish I had enough time to write back to everyone but it has gotten a bit overwhelming to do so. I will try to write back to some of you time permitting. When to have bunion surgery when you are not in pain.